Sorry, Kanger TopBox Mini All-Inclusive Starter Bundle has been discontinued. This is an online bundle only, it is not available in stores. The ideal bundle for a first-time vaper looking to make the switch with a premium, advanced device. Including all you need for your first few weeks of vaping! To facilitate your transition from smoking to vaping, we have bundled the popular Kanger TopBox Mini Kit with everything you need to make a durable switch to vaping. In addition to the usual content of the kit, 180 Smoke has added an extra pack of 5 replacement coils, 2 replaceable batteries, an external dual-charger, and a generous 90ml of e-liquid, all at 25% off! The Kanger TopBox 75W TC Kit is ideal for a new vaper who wants to get large, flavourful clouds of vapor right away! It is easy to use but powerful and customizable. The new TopBox Mini Starter Kit includes the KBox Mini TC 75W Mod and the TopTank Mini. 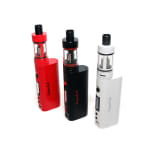 The TopBox Mini Starter Kit is the upgraded version of the popular Subox Mini Starter Kit. This kit caters to both advanced and new users with the all new temperature control and top-filling features. The KBOX Mini TC 75W Mod can fire up to 75W and now supports temperature control with nickel, titanium, stainless, and Ni-Chrome wire. 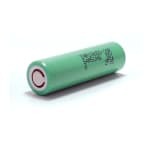 It requires one 18650 battery, and we included two in this bundle, and has a magnetized battery cover for easy and convenient access. The TopTank Mini is the upgraded version of the ever popular Subtank Mini. The TopTank Mini now offers a top-fill option for easy e-liquid refills, and supports the new SSOCC atomizer heads which allows for more airflow, vapor, and flavor. We've bundled it with two replaceable 18650 batteries, and external dual-charger for uninterrupted vaping in any situation, a pack of replacement coils, and 90ml of e-juice (3x30ml). Dimensions: 3-1/4" x 1-1/2" x 7/8"
Just got this kit last week. Overall works well, and the tobacco liquid is nice enough to keep me off my stinkies so far. Nice device, not too big and pretty good flavour! No complaints from me! I bought this kit as a first time user. This kit has been so user friendly it's unbelievable. I figured I would have a manual to read, some setup to do. Absolutely not I screwed the tank into the box and it was set to go with an atomizer already installed dropped some liquid in and was ready immediately. This kit comes with 5 atomizer in the box 3 atomizers in the kit for the actual unit and another already installed 9 all together that isn't very clearly listed and is a very nice addition. The charger works wonderfully it took me a quick minute to figure out I was having issues with my USB port not fitting it properly I changed to a wall USB charger port and it worked perfect. The kit includes and extra high capacity battery even though 1 is plenty and 60ML of E-liquid. I wasn't sure at first how much exactly that was but it is actually a very large amount I would say 30ML is probably equal or greater than a carton of cigarettes. The Caribbean Cocktail liquid is ok not very flavorful but produces a solid amount of vapor and a great simulation to smoking with some throat kick this is obviously adjustable with the absolutely excellent vaporizer unit. The unit has a ton of customization with very little knowledge necessary. A small dial determines how much air you take in with the vapor and the heating is customized by a plus and a minus button down to a 10th of a degree. Within 20 minutes of playing around and finding my settings I have had a great time using it and feel very happy with the purchase. It seemed like a lot to shell out for being a beginner but I have absolutely no regrets with it the amount included in the kit is substantial, the unit is pristine and works flawlessly better than expected and all of the additions I feel I won't have to buy anything for it for quite a while except more flavors of course. tl;dr Awesome buy, great for beginners and regular users alike 10/10 would buy again and recommend to friends. I can't say enough good things about this deal. The Topbox is small and portable, can be customized to a great deal, or you can just leave it as is for a great vaping experience, A great way to get into the temp controlled and mod game,. It has all the coil options you could want. The kit can be setup for mouth to lung hits or just direct lung hits, produces great clouds and the flavor is fantastic. Highly recommended for anyone who is looking to step-up into the mod game. The top box is great for both beginning vapers and the more experienced. The top fill feature on the tank is very convenient for refilling. The now 75w mod also feature temp control for more options. The full kit also comes with three coild to give the newer vapers a chance to experience the difference between types of coils. I definitely enjoyed this kit! Very easy to use and understand as a first time vaper. This is my favorite kit that I have bought so far. The Kanger Topbox Mini is an awesome setup, and the price is really great for all the stuff that you get with this bundle. You get coils, a charger, and an extra battery....was checking out some other places, and the price would have been closer to 200$ for all the stuff I got for around $150. I purchased two of the blueberry, two of the strawberry, and two of the smooth mint liquids, and all of them taste really clean and high quality. I will have to get some of the premium line on my next order to try them out - really enjoying the 180 juice.